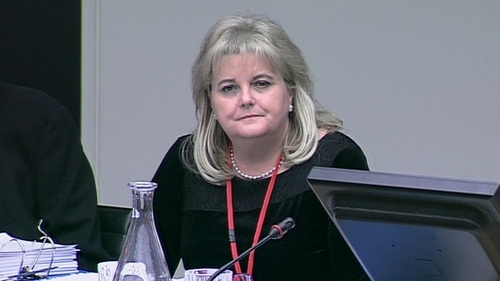 The case being taken by the former CEO of the Rehab group, Angela Kerins, against the Dáil's Public Accounts Committee is of singular importance and will have resonance for years, her lawyers have told the Supreme Court. Ms Kerins is appealing against the dismissal of her action against the committee. She claims two hearings in 2014 into money paid to the Rehab Group amounted to a witch hunt against her. Ms Kerins wants to claim damages for personal injury, loss of reputation and loss of career. And she wants references to her and her employment with the group to be deleted from the committee's record. The High Court found the courts could not intervene at all in relation to Dáil committee proceedings. Her Senior Counsel, John Rogers, told the Supreme Court this morning, that the events at the first hearing, on 27 February 2014, changed Ms Kerins' life forever. She wants the court to decide whether or not a citizen who suffered what she had suffered is entitled to a remedy before the courts. Mr Rogers told the court that Ms Kerins' self-harmed after the first hearing. He said she had not disclosed this before swearing a document shortly before the High Court proceedings. But he said she had disclosed it because she hoped no one would ever again have to go through what she had experienced. The court is also due to hear a cross-appeal by the Committee against a decision directing it to pay most of Ms Kerins' costs. Ms Kerins' appeal jumped straight to the Supreme Court due to the exceptional nature and importance of the issues involved. The proceedings are expected to last for four days. Next week, the Court will hear an appeal by Denis O'Brien in a separate but similar case over statements made by two TDs in the Dáil about his banking affairs. Mr Rogers said if Ms Kerins' legacy was to save others from attacks similar to those she had suffered then her distress at disclosing the effects on her, would not be in vain. He said damages were not the primary remedy she was seeking. She wanted the record deleted and a declaration that what the PAC did was unlawful. Ms Kerins wanted a resolution of the wrong done to her and a statement from the appropriate organ of State that what was done to her was unlawful. He said PAC purported to be investigating payments made to the Health Service Executive but it ended up investigating payments made by Rehab. Mr Rogers claimed that the members of the Committee were trying to create a jurisdiction for themselves by making out that they were investigating Rehab's use of "taxpayers' money". But he said what was being paid to the Rehab group via Service Level Agreements was not a subsidy or a donation but a payment for services provided by Rehab to the HSE. Mr Rogers said there was not a screed of paper where one could find reference to the power given to the PAC to investigate payments or spending by Rehab. He said the committee members as members of Dáil Éireann knew their powers were confined to an entitlement to examine accounts or reports prepared by the Comptroller and Auditor General and laid before the Dáil. And the C&AG had made no such reports in relation to Rehab. Mr Rogers said a body purporting to exercise the power of the State to conduct an examination like this must conform with the rules of natural justice. He said its doings are subject to the jurisdiction of the court, where it is putting the personal rights of citizens at risk. Referring to the High Court's judgment that it had been recognised for more than four centuries, that the courts had no function in relation to speech in parliament.Mr Rogers said this was a "fright to every citizen". He said this case was not about the law of the English parliament four centuries ago. He said speech made in the Dáil chamber was absolutely privileged and no one was trying to say anything else. But Mr Rogers submitted, this case was about utterances directed at individual citizens who had presented at a committee and were being "blackguarded" by deputies. He said blackguarded is what happened in this case. The members of the committee sought to disparage Ms Kerins to the point where the high court found her reputation had been damaged. He claimed Ms Kerins had been misled by the Committee from the "get-go". During the afternoon, Mr Rogers read transcripts of the Public Accounts Committee hearings on Rehab to the Supreme Court. He described remarks made by the members of the Committee as "shocking" and "mind boggling" and said the deputies were engaging in "rhetorical condemnation". They were proclaiming that the Rehab group had no right to privacy. He described the Committee as "off the rails" and a train that was going to crash. He said the Committee perceived itself as having a very wide remit to ask questions about all sorts of private matters. He described the second hearing in April which Ms Kerins did not attend due to ill health as a "horrifying event" in terms of citizens' engagement with parliament. He said citizens had a right to their good name under the constitution. Mr Rogers submitted the committee members had abused their power because the questions they wanted to ask in relation to rehab were outside their remit. He told the court that Articles 15.12 and 15.13 which deal with "utterances" made by members in the Oireachtas, did not apply to Oireachtas committees or at the very least, only applied to committees who were carrying out the job they were supposed to be doing. Mr Rogers will continue his submissions to the Supreme Court tomorrow.